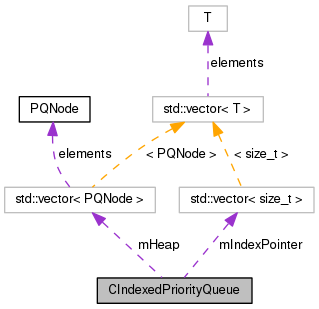 The CIndexedPriorityQueue class provides an indexed priority queue. Each element consistes of a pair of values, a key and an index. The elements in the queue are ordered according to the value of their key. Since for stochastic simulations the minimum time is required, the queue is ordered so that the element with the minimum key value is at the top. This is the opposite of the normal ordering of priority queues. The index can be used to access elements from positions other than at the front of the queue. Definition at line 78 of file CIndexedPriorityQueue.h. Definition at line 27 of file CIndexedPriorityQueue.cpp. Definition at line 30 of file CIndexedPriorityQueue.cpp. Build moves entries until the correct ordering is achieved. Definition at line 127 of file CIndexedPriorityQueue.cpp. References C_INVALID_INDEX, heapify(), and mHeap. Definition at line 135 of file CIndexedPriorityQueue.cpp. Referenced by CStochNextReactionMethod::setupPriorityQueue(), CHybridMethodODE45::setupPriorityQueue(), CHybridMethod::setupPriorityQueue(), and CHybridMethodLSODA::setupPriorityQueue(). Definition at line 172 of file CIndexedPriorityQueue.h. Referenced by CStochNextReactionMethod::updatePriorityQueue(), CHybridMethod::updateTauMu(), CHybridMethodLSODA::updateTauMu(), and CHybridMethodODE45::updateTauMu(). Definition at line 164 of file CIndexedPriorityQueue.cpp. References leftChild(), mHeap, rightChild(), and swapNodes(). Referenced by buildHeap(), and removeStochReaction(). Definition at line 92 of file CIndexedPriorityQueue.cpp. Referenced by CHybridMethodODE45::setupPriorityQueue(), CHybridMethod::setupPriorityQueue(), and CHybridMethodLSODA::setupPriorityQueue(). Inserts the node with the given index and key into the tree. The index has to exist in the index array of course. Definition at line 68 of file CIndexedPriorityQueue.cpp. References mHeap, mIndexPointer, parent(), and swapNodes(). Referenced by CHybridMethod::partitionSystem(), CHybridMethodLSODA::partitionSystem(), CHybridMethodODE45::setupPriorityQueue(), CHybridMethod::setupPriorityQueue(), and CHybridMethodLSODA::setupPriorityQueue(). Provide the position in the heap of the left child of the current node. Definition at line 216 of file CIndexedPriorityQueue.h. Referenced by heapify(), and updateAux(). Definition at line 161 of file CIndexedPriorityQueue.h. Provide the position in the heap of the parent to a node. The positions are numbered from zero; a parent position less than zero implies that the current node is already at the top of the tree. Definition at line 209 of file CIndexedPriorityQueue.h. Referenced by insertStochReaction(), and updateAux(). Definition at line 102 of file CIndexedPriorityQueue.cpp. References CCopasiMessage::ERROR, mHeap, and mIndexPointer. Deletes the node in the tree with the given index. The pointer in the index array is removed. Definition at line 44 of file CIndexedPriorityQueue.cpp. References C_INVALID_INDEX, heapify(), mHeap, mIndexPointer, and swapNodes(). Referenced by CHybridMethod::partitionSystem(), and CHybridMethodLSODA::partitionSystem(). Provide the position in the heap of the right child of the current node. Definition at line 223 of file CIndexedPriorityQueue.h. Definition at line 134 of file CIndexedPriorityQueue.h. Referenced by CHybridNextReactionLSODAMethod::doSingleStep(), and CHybridNextReactionRKMethod::doSingleStep(). Swap a pair of nodes and update the index structure accordingly. Definition at line 146 of file CIndexedPriorityQueue.cpp. References C_FLOAT64, mHeap, and mIndexPointer. Referenced by heapify(), insertStochReaction(), removeStochReaction(), and updateAux(). Definition at line 38 of file CIndexedPriorityQueue.cpp. Referenced by CStochNextReactionMethod::doSingleStep(), CHybridMethod::getStochTimeAndIndex(), CHybridMethodLSODA::getStochTimeAndIndex(), and CHybridMethodODE45::getStochTimeAndIndex(). Definition at line 33 of file CIndexedPriorityQueue.cpp. Used by the updateNode function. Update the node at a given position. Definition at line 188 of file CIndexedPriorityQueue.cpp. References C_FLOAT64, C_INVALID_INDEX, leftChild(), mHeap, min, parent(), rightChild(), and swapNodes(). Update the key value of a node at a given index. This also moves the node to the correct position if neccessary. Definition at line 138 of file CIndexedPriorityQueue.cpp. References mHeap, mIndexPointer, and updateAux(). Referenced by CStochNextReactionMethod::updatePriorityQueue(), CHybridMethod::updatePriorityQueue(), CHybridMethodLSODA::updatePriorityQueue(), CHybridMethodODE45::updatePriorityQueue(), CHybridMethod::updateTauMu(), CHybridMethodLSODA::updateTauMu(), and CHybridMethodODE45::updateTauMu(). Definition at line 286 of file CIndexedPriorityQueue.cpp. Definition at line 230 of file CIndexedPriorityQueue.h. Referenced by buildHeap(), clear(), getKey(), heapify(), insertStochReaction(), operator<<(), operator(), pushPair(), removeStochReaction(), size(), swapNodes(), topIndex(), topKey(), updateAux(), and updateNode(). Definition at line 234 of file CIndexedPriorityQueue.h. Referenced by clear(), getKey(), initializeIndexPointer(), insertStochReaction(), operator<<(), pushPair(), removeStochReaction(), swapNodes(), and updateNode().